When I woke up Monday, I had but one thing on my mind: pumpkin pancakes. With leftover canned organic pumpkin puree calling from my fridge, I knew I had to put it to use. What better way than a warm, fluffy pancake? With the added pumpkin puree and the accompanying spices, these delicious Pumpkin Pancakes have an aroma that reminds me of Thanksgiving day, my happy childhood and good friends, all rolled up into one. While you probably won’t taste the banana, it adds both a nutritional boost and a delicate sweetness that is enhanced with the brown sugar. But don’t dare eat these plain. 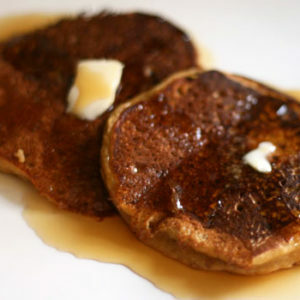 These pancakes are best drizzled with cold maple syrup and spotted with a dot of butter. I wasn’t sure how my kids would react when I served up these pumpkin pancakes. But it’s a testament to their taste that both Will and Paige each finished their pancake (they typically will eat just one pancake) and clamored for more. Got leftover pumpkin from the pumpkin cookies? Try these. They are quick, easy and — as Will says — DEEEEEE-Licious. Combine all ingredients in a medium bowl. Use a scoop to place on a hot griddle and cook, flipping once when the top gets bubbly. Love the accidental heart-shaped butter piece! I WILL be making these this weekend. I’ll let you know how it goes. I’m always looking for ways to use pumpkin and I’ve been craving pancakes so this weekend I’ll have at this recipe. I’m anticipating the yum! They were really good! but next time i’ll leave out the banana, it was a tad overpowering. Loved loved loved these! The banana was definitely noticeable, but it really added natural sweetness and delicious flavor and texture. 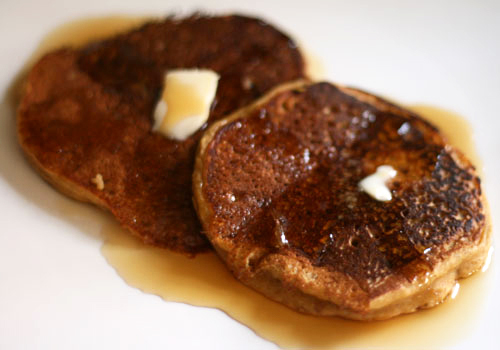 I added a bit more cinnamon and am saving this as my go-to pumpkin pancake recipe!